China’s era of sustained industrial sector growth started shortly after then Chairman Deng Xiaoping began introducing economic reforms in the early and mid-1980s. By the 1990s, China’s industrial growth entailed, in part, importing massive amounts of secondary commodities, including scrap metal, paper and plastic. China’s seemingly “no strings attached” welcoming attitude toward imported scrap changed perceptibly in 2013 with Operation Green Fence. That action, led by a coalition of Chinese central government agencies, was designed to enforce frequently ignored quality standards for imported materials, with a sharp focus on mixed plastics and mixed paper. In 2017, the National Sword campaign and several following actions brought further restrictions, this time including contaminant limits that are tougher than the global standards and outright bans on certain scrap materials. For traders and scrap processors, the landscape appears to have changed abruptly and permanently. Trade negotiators from North America and Europe are questioning China’s newly declared restrictions, but the Chinese government has positioned the scrap material bans as an internal environmental matter. In 2018 and beyond, recyclers undoubtedly will watch for any changes on the policy front. At the same time, however, they also are researching and making capital investments designed to adjust to the new reality that involves finding new ways to prepare certain grades of scrap. Operation Green Fence in 2013 caused some discomfort and changes to the scrap metal sector, but the major impact occurred within the material recovery facility (MRF) sector. For more than a decade, operators of many of these plants had become accustomed to allowing outthrow and contaminant levels on export shipments to drift upward, as Chinese buyers desperate for sufficient volume offered relatively few quality complaints. Changing attitudes in China perhaps can be ascribed partially to protectionism (and stimulating China’s domestic recycling activities), but the issue as described by China’s government is laden with references to “foreign garbage,” usually pointing to substandard mixed paper and mixed plastic shipments. Plastic scrap, in particular, has been demonized, in part by a 2016 documentary called “Plastic China” that reportedly enjoyed wide viewership in China, perhaps even at the highest levels of the government. The 82-minute documentary focuses on one woman and her 11-year-old daughter who work at and live next to a sizable plastic scrap sorting operation where “foreign garbage,” as referred to by the documentarians, is sorted by hand. Media reports in China indicate the documentary struck a nerve in the nation, perhaps all the way up to the level of current chairman Xi Jinping. Without question, as China introduced its new scrap import restrictions in 2017, the restrictions were harsh and immediate in the plastics sector. By the spring of 2017, thousands of containers of plastic scrap were being refused entry into Chinese ports. Some 5,000 containers were reportedly stuck in drayage in Hong Kong by April 2017. According to John Paul Mackens of freight forwarder Kuehne + Nagel, who gave a presentation at the 2017 Paper & Plastics Recycling Conference Europe in early November, Europe sent 89 percent of its outbound plastic scrap to Chinese ports in 2016. In September 2017, Mackens said, just 46 percent went to Chinese ports, with Malaysia receiving 12.6 percent, Hong Kong receiving 10.7 percent and Vietnam 9.5 percent. 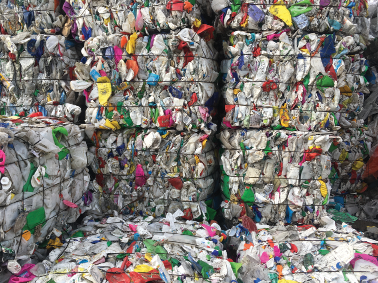 As of early 2018, plastic scrap stockpiles reportedly are building at MRFs throughout the United States. Of the two dozen scrap materials that faced outright import prohibitions in China, eight were forms of plastic scrap and one was a mixed paper grade. The other materials included metallic slags and residues and used clothing or textile shipments. For MRF operators and other paper and plastics recyclers, the adjustments needed have been swift, and likely are permanent (in the plastics sector). With the current situation, sources say it can be hard to spot the opportunities within the challenge. For MRF operators, that can mean accepting commingled residential materials and separating or sorting them to a level where they appear not to have been part of a commingled collection program. In the wake of 2013’s Operation Green Fence, technology suppliers to the MRF sector enjoyed a boom in new automated and optical sorting investments. While such suppliers are privately owned and do not report sales figures, this decade’s flurry of sales and installation announcements points to ongoing investments by MRF owners. Municipal collection and hauling contracts on the MRF side and industrial service arrangements on the scrap metal side can make it difficult for recyclers in the U.S. to simply refuse newly restricted materials because of obligations that may be in the contract. The sustainability movement among manufacturers and consumer products companies provides another incentive for recyclers to find solutions. However, with the North American recycling sector largely in corporate rather than government hands, profit-and-loss considerations will play a major role in how processors respond to the new landscape. In the MRF sector, suppliers of screening and sorting equipment and systems have announced a steady succession of sales to recycling companies who, because of contract commitments, will continue to accept a high volume of material and must then sort it thoroughly. Ron Sherga of Arlington, Texas-based EcoStrateis among the companies that could be poised to benefit from China’s import restrictions. EcoStrate, the 2017 Institute of Scrap Recycling Industries (ISRI) Design for Recycling award winner, takes in mixed and traditionally “difficult to recycle” plastic scrap and converts it to street signs, park benches and other manufactured items. While he is glad EcoStrate is benefitting from the changes, Sherga indicates he would rather see more U.S. companies finding ways to process and consume American scrap materials. To spin China’s import restrictions as a positive for U.S. recyclers can seem far-fetched as companies struggle to react in early 2018. When, or if, a longer-term reaction of pursuing opportunities takes shape in the ensuing months is likely to influence recycling company strategies throughout the rest of 2018 and into the next year. A version of this article ran in the March issue of Recycling Today, a sister publication to Waste Today. The author is editor of Recycling Today and can be contacted at btaylor@gie.net. Following a two-decade surge of China-bound shipments of secondary raw materials, recycling companies in the United States are engaged in a new stage of research to determine a path forward. 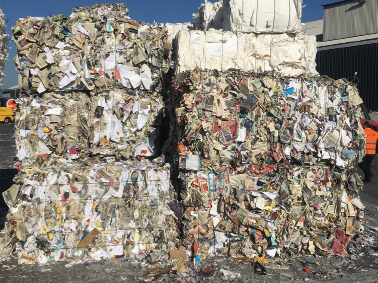 Paper and plastic recyclers, especially operators of material recovery facilities (MRFs), have spent those two decades creating large volumes of mixed paper and mixed plastic bales for shipment to China. On the scrap metal side during those two decades, the buying habits of Chinese processors and consumers largely dictated how scrap motors, lower grade wire and cable and shredder plant mixed nonferrous metals were handled. The Chinese government’s new restrictions have taken aim at precisely these materials and grades, causing recycling firms to take immediate action. In the MRF sector, figuring out what to do with commingled plastic has caused chaos. In early 2018, recyclers were reporting stockpiles of many types of plastic scrap in geographic locations ranging from Utah to Canada to Eastern Europe. Kimberly-Clark has reported progress toward achieving its Sustainability 2022 goals to create social, environmental and business value. Kimberly-Clark Corp.—the Dallas-based company behind brands such as Kleenex, Huggies and Cottonelle—has reported progress toward achieving its Sustainability 2022 goals to create social, environmental and business value. "We continue to make strides in our efforts to create positive social and environmental change,” Kimberly-Clark Chairman and CEO Thomas Falk says, "That's why we are committed to an ambitious set of sustainability goals that will have a lasting impact on the people we serve around the world and the communities we touch." Kimberly-Clark's 2017 Global Sustainability Report outlines the company's strategies and is organized and presented in accordance with the Global Reporting Initiative (GRI) Sustainability Reporting Standards, Core level. Social Impact: In the first two years, the lives of 4.3 million people in need worldwide have benefited through programs that increase access to sanitation, help children thrive and empower women and girls. Forests & Fiber: Sourced 89 percent of the fiber used in tissue products from environmentally preferred sources, including FSC-certified virgin fiber and recycled fiber. Waste & Recycling: Further increased the amount of waste diverted from landfills (includes both manufacturing and non-manufacturing facilities) to 95 percent. Energy & Climate: Lowered its absolute greenhouse gas (GHG) emissions by 18 percent (from 2005 baseline) through improved energy efficiency and increased use of alternative energy sources. Supply Chain: Invested in watershed analyses, as well as water treatment and recycling technologies, to further reduce the company’s water consumption in water-stressed areas. In addition, Kimberly-Clark also announced expanded programming in several key areas. The company began measuring and reporting on Scope 3 GHG emissions—the indirect emissions that occur both upstream and downstream in the value chain—and will establish reduction targets later this year. The company worked with the World Resources Institute, Washington, and World Wildlife Fund, Gland, Switzerland, to identify the company's primary sources of Scope 3 emissions. This work comes on the heels of a major commitment in 2017 to annually purchase approximately 1 million megawatt hours of renewable wind energy, equivalent to about one-third of the electricity needs of Kimberly-Clark's North American manufacturing operations. "While our work in 2017 has put us ahead of schedule on our GHG emissions goals, we see continued opportunities to unlock business value from our energy and climate strategy," Kimberly-Clark Vice President of Safety and Sustainability Lisa Morden says. "The focus on Scope 3 emissions will help us work with our suppliers and customers to identify opportunities for greater efficiencies across our supply chain." The company also plans to drive further gains toward its goal of diverting at least 150,000 metric tons of waste through programs that reduce waste or divert it from low-value disposal outlets to higher value, more beneficial uses. "Our challenge is to eliminate waste in our processes, products and packaging, while also exceeding customers' expectations with safe and effective products that can be properly managed after use," Morden says. "By adopting a systems-based approach with key partners, we can play a role in enabling the circular economy, one which is restorative and creates value." Earlier this year, Kimberly-Clark joined the Closed Loop Ocean initiative to help prevent plastic leaking into the world's oceans, and it will continue to promote critical labelling programs to provide simple, consistent recycling or disposal instructions for consumers. Further, Kimberly-Clark Professional's RightCycle Program has reclaimed and recycled more than 600 metric tons of non-hazardous lab, cleanroom and industrial waste, including apparel, gloves and safety eyewear since 2013. "I am proud of our dedicated employees around the world—and our many partners, suppliers and customers—who are part of achieving these goals," Morden says. "Through sustainable practices that support a healthy planet, we can build stronger communities and ensure our business thrives for decades to come." Penn Waste’s recent $3.5 million retrofit was commissioned as China rolled out its stringent scrap import specifications, allowing the Pennsylvania MRF enough time to adjust. When reviewing the recent successes at Penn Waste in York, Pennsylvania, much of the waste and recycling company’s achievements can be credited to its ability to adjust to new market conditions. Being adaptable has helped Penn Waste to weather the storm of China’s import bans on specific scrap commodities and stringent specifications for incoming material by creating a new recovered paper grade—what the recycling industry calls a hard mix—that is sold into new markets beyond China. In January, Penn Waste set a record for the number of tons recovered in a month at its 96,000-square-foot single-stream material recovery facility (MRF). At 16,000 tons in January, Tim Horkay, Penn Waste director of recycling operations, says the MRF’s volume grew 100 percent from the 8,000 tons per month it processed when it opened in 2015. The company completed a $3.5 million retrofit project at its Manchester, Pennsylvania, MRF in July 2017 to allow it to adapt to the container-heavy composition of the incoming residential material stream created by the reduction of newspapers and other papers. The upgrades included one of the first investments in Max-AI artificial intelligence (AI) technology from Bulk Handling Systems (BHS), Eugene, Oregon, and a re-engineered container line, which includes three new optical sorting units that complement the MRF’s three original optical units, among other updates. “The retrofit has allowed us to increase throughput, increase material capture and reduce head count,” Horkay says. While the MRF attempted to comply initially to China’s strict standards, the measures it took weren’t enough to meet the 0.5 percent prohibitive requirement. Penn Waste slowed its machines down by 10 tons per hour and added workers, all after its retrofit had been completed. Penn Waste is producing around 4,100 tons per month of hard mix material, which is comprised of more than 30 percent old corrugated containers (OCC), “other papers” and an unidentified amount of prohibitives, Horkay says. About 80 percent of this material is sold to the Indian market. Mascots can be used to bring good luck and represent a group with a common public identity. 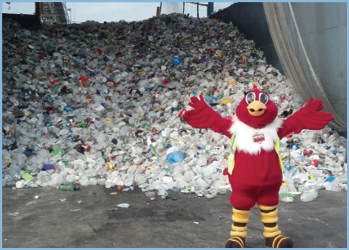 For Penn Waste, York, Pennsylvania, the company’s official mascot teaches the public about what can and cannot be recycled. 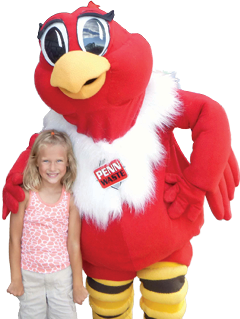 Penny is a bird who visits schools and events to teach children and adults all about recycling. In a highly interactive presentation, Penny explains what is accepted in curbside recycling bins. Penny visits eligible organizations at no cost to them. On its website, pennwaste.com, the company highlights “10 Reasons to Recycle” by Penny, including the fact that recycling creates jobs, is good for the economy, saves energy and creates new demand. “Recycling and buying recycled products creates demand for more recycled products, decreasing waste and helping our environment,” Penny writes on the website. Penn Waste serves 185,000 residents and 4,500 commercial accounts. The more than 100 trucks that leave the company’s South Central Pennsylvania material recovery facility (MRF) daily are wrapped in messages encouraging communities to recycle right. The Max-AI technology is designed to improve container line performance. At Penn Waste, the Max-AI Autonomous QC (AQC) unit works in conjunction with an existing SpydIR optical sorter from NRT, Nashville, Tennessee, targeting polyethylene terephthalate (PET) plastics. The technology uses AI to identify nonPET items for the AQC to pick and return to the container line’s onset. In addition to the Max-AI AQC, Penn Waste added three new NRT optical sorters coupled with an NRT MetalDirector. The company also added a SDS 800-i from Nihot, Amsterdam, to clean larger volumes of glass. Glass makes up about 16 percent of Penn Waste’s total incoming material stream. Horkay says about 90 percent of this material is removed early in the sorting process with screening technology. Penn Waste markets the cullet to a Pennsylvania company that color sorts it with optical equipment and then sells it. 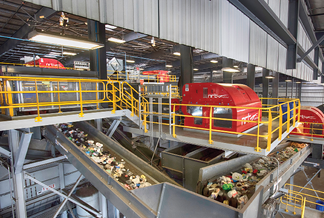 On its “last chance” residue line, Penn Waste added an optical sorter to remove containers and metals. The optical sorters enable the automated separation of additional plastic commodities, including polypropylene (PP) and colored and natural high-density polyethylene (HDPE). In two nine-hour shifts, five days per week, 67 workers and the new equipment help the MRF to reach a high capture rate on commodities, Horkay says. The new system was commissioned in fall 2017. With a capacity to sort 18,000 to 20,000 tons of materials each month, Horkay says the MRF is currently managing 15,000 to 16,000 tons per month. Horkay says the AI technology is driven by a vision system, which collects data as material passes by on a belt. “The future of the vision system will allow the robots to see the material coming in and adjust the system downstream to handle it by slowing belts and talking to the robots in front,” he explains. Other advantages of the robotic and AI system include a cleaner material stream on the back end and more yield per pound for plastic, Horkay says. The robot and AI system offer new ways to recover material, which will help the Mid-Atlantic company enter new markets and recover additional materials to sell. With new equipment throughout the MRF, Horkay says Penn Waste is looking ahead to other new opportunities. The robot and AI system offer new ways to recover material as well as new job classes. For every three robots, one technical worker is required. “It is creating another job class for us—a more technical job class—so we’re hiring more skilled employees to run these,” Horkay says. The Mid-Atlantic company also has plans to enter new markets and recover additional materials to sell. Beyond its hard mix grade, Horkay says the MRF is figuring out how to generate additional revenue “by digging deeper into the stream to see what we can recover and make money on. “Building a sellable product has been the cornerstone of Penn Waste since commissioning the system,” Horkay adds. Lastly, the company can now offer more insights to its customers through data collected daily on its new system. “We believe in data and we believe in selling with that data,” Horkay says. The author is associate editor of the Recycling Today Media Group and can be contacted via email at mworkman@gie.net. This article originally appeared in the March issue of Recycling Today, a sister publication of Waste Today. The California Department of Resources Recycling and Recovery has announced the 10 winners of its fiscal year 2017-2018 Organics Grant Program. The California Department of Resources Recycling and Recovery (CalRecycle), Sacramento, California, has awarded more than $25 million in California Climate Investments to bolster organics recycling infrastructure in the state and rescue edible food for Californians in need. The projects in 10 California communities are set to transform nearly a half-million tons of discarded food, green waste and other organic materials into value-added products such as biofuel, compost, fertilizers and soil amendments, CalRecycle says. According to CalRecycle, when sent to landfills, organic waste decomposes and generates methane, a short-lived climate pollutant 70 times more potent than carbon dioxide. CalRecycle says its Organics Grant Program helps fund construction, renovation or expansion of California facilities that recycle organic material into products like compost and renewable energy. CalRecycle’s Organics Grant Program is part of California Climate Investments, a statewide program that puts billions of Cap-and-Trade dollars to work reducing greenhouse gas emissions, strengthening the economy and improving human health and the environment—particularly in disadvantaged communities. CalRecycle awards Organics Grants based on criteria of greenhouse gas reductions, the amount of organic material diverted from landfills, benefits to low-income and disadvantaged communities and project readiness. Eligible applicants include cities, counties and other local agencies. More information about CalRecycle’s Organics Grants can be found here. Known as e-Manifest, the system is designed to improve access to higher quality and timelier hazardous waste shipment data. "Creation of the e-Manifest system demonstrates EPA’s commitment to innovation and robust collaboration with states and the private sector," EPA Administrator Scott Pruitt says. "Through this extensive modernization of the hazardous waste program, the e-Manifest system will significantly reduce regulatory burdens and save businesses and states valuable time and resources, while improving protection of human health and the environment." As of June 30, users must submit all manifests, whether paper or electronic, to EPA's e-Manifest system. There are several ways to submit manifests to EPA, ranging from mailing conventional paper to full electronic delivery. Receiving facilities will pay a fee that varies based on how the manifest is submitted. "EPA is very excited to partner closely with the waste management industry to bring much needed efficiency and modernization to how companies track and manage wastes, and how they work with government agencies," Alexandra Dunn, regional administrator of EPA’s New England office, says. "We are confident that updating these systems will yield a reduction of regulatory burden, saving time and resources, and improving protection of human health and the environment." "The successful launch of EPA's e-Manifest system is a very significant accomplishment," Terri Goldberg, executive director of Northeast Waste Management Officials' Association, Boston, says. "The New England state environmental agencies are eager to work with EPA Region 1 on implementing the new system and look forward to having the enhanced access to data and information that it will provide. Once the online system is fully functioning and all parties are utilizing its features, the New England states believe that it will reduce the reporting burdens on generators, haulers and TSDFs (treatment, storage and disposal facilities) and help all parties save time and associated costs." The agency will also re-evaluate whether additional security measures are necessary for a small subset of manifest data about certain acute hazardous wastes. In the interim, EPA will be working directly with impacted receiving facilities on specific procedures related to those manifests. Additionally, EPA recently announced it would grant receiving facilities extra time to submit paper manifests in the initial months after system launch to further support industry implementation. Facilities that receive manifested waste between June 30 and Sept. 1 will now have until Sept. 30 to send those paper manifests to EPA.